This is about the reading habits of a lazy but lucky person. Right now, I am in a fortunate situation of earning American wages, living frugally in Hong Kong and being able to buy books from mainland China at their local rates. Every week, I would walk through the bookstores of Mongkok district and pick up dozens of books. But who has time to read all those books? I only have 24 hours per day. Ah, not if I pick up photo-illustrated books, and this is a quick and effective way of learning about history and culture. But it doesn't always work. So this is about one of those reading exercises. At the bookstore, I looked at the description for this book: "The first exclusive report on the Japanese bacterial war at Changde" and there seems to be plenty of photographs throughout this book. Nice! For a grand sum of 36 yuan (less than a McDonald's special meal in New York City), I picked up this book. (a) On 4 November 1941, Japanese military aircraft of Unit 731 flew over Changde and dropped cotton, grains and other goods along with plague-infected fleas right in the center of the town. (b) The first patient came down with bubonic plague on 11 November, and in the roughly two months after the first outbreak, the primary outbreak killed eight people in the area of the town (according to an epidemiological report at the time). However, after a two-month lull, a second outbreak came in March 1942, and a total of 34 people in the town area perished (according to the aforementioned report). The primary outbreak was likely caused by direction transmission, through bites by plague-infected fleas that had been dropped from the military aircraft. The secondary outbreak was believed to have been caused by indirect transmission; it likely started first in rodents which carried the plague throughout the winter then proceeded during the active spring period to infect humans via fleas infected by the rodents. (c) Beginning in March 1942, the plague in the area of Changde proceeded to spread to farming villages, with many deaths reported in various areas. The number of deaths from the Changde plague reached 7,643, according to the Changde germ warfare victims investigation committee, although the scope of the investigation was extremely broad. For the lazy person looking for instant gratification, the better book about the battle of Changde is this photographic album about the War of Resistance. Published by the Guanxi Normal University Press, this 300-page book cost 48 yuan, slightly more than a Starbucks special order. 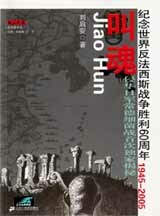 But only several pages are about the battle of Changde. According to the first book, the battle of Changde began silently in 1941 when a Japanese airplane sprayed bubonic plague bacteria in that area hoping to cause panic and soften the resistance. It caused many casualties, but not devastatingly so. The actual battle of Changde began later on November 11, 1943. The Japanese attacked in full force against a Chinese Nationalist force of about 8,000 strong with all the remaining civilians having been evacuated already. Here by 'full force' is meant artillery, tanks, infantry, airstrikes and poison gas attacks. The Chinese fought on until only 200 out of the 8,000 were left and had to be evacuated. On December 3, 1943, the Japanese army occupied Changde, which was a totally devastated city burnt to the ground during the siege. But the story would move on to a different phase. Military amateurs speak of tactics and strategies, whereas the experts speak of logistics. War is not only about having the finest weapons and trained men; it is about how one can support and feed that army. By driving so far deep into the Chinese heartland, the Japanese supply lines were stretched thin and vulnerable. Six days after the fall of Changde, the Chinese army re-grouped and counter-attacked. The Japanese had no response, and suffered more casualties than the Chinese as they fell back in disarray. Changde went back in Chinese hands in January 1944. 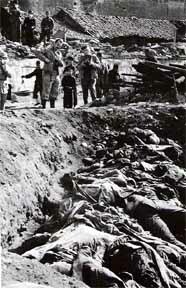 The following photograph is a mass burial pit for dead Japanese soldiers at Changde. As I read through these two books, I wish I could draw some historical or moral lesson. There is not much to say. Unit 731 had access to bubonic plague, but it could not effectively weaponize the bacteria to cause truly mass destruction but it was not completely ineffective either. The formal military battle was a meat grinder of attrition, but that is just standard. I would like to tell you that there is nothing extraordinary here, but that is not true. It is just that I don't have the energy to translate Chapter 10 of Jiao Hun about the 201 dead in the Zhu extended family house, or Chapter 11 about how the funeral home owners at Zhegongqiao Town could no longer bear to charge for the many coffins, or Chapter 12 about how the Ding-Li wedding was held in the same place and time as the funeral of the bridegroom's parents and 9 other family members. 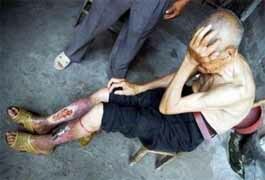 The accompanying story is: "On the left, Jiang Hongcai, 81, and on the right, He Fuxin, 86, whose feet have rotten due to an anthrax fungus infection, in Jinhua, east China's Zhejiang province, July 5, 2005. 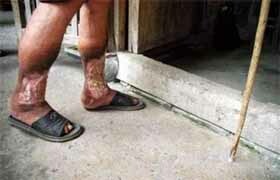 They are victims of the germ-warfare launched by Japanese troops during World War II. Starting from October 1940, Japanese troops launched an extensive germ-warfare in China, spreading bacterium of plague, cholera, typhoid fever, anthrax and glanders in Jinhua and Quzhou of Zhejiang, killing more than 60,000 Chinese. Many survivors have been wrecked by the toadstool to this day." 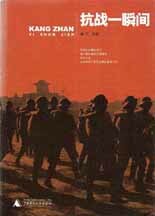 As a parting shot, I will note that the Jiao Hun book had the subtitle "In memory of the 60th anniversary of the world's victory in the anti-fascist war: 1945-2005." Victories over the Japanese in battles such as the one at Changde ought to be celebrated as such. Shamefully, that is not the usual case. On one side of the strait, the Chinese Communist lore will only refer to the victory at Pingyingguan or the Campaign of 100 Regiments in which the Communists fought and little about what the Chinese Nationalist army did in places like Changde. On the other side of the strait, talking about the victory of the army of the Republic of China at Changde over the Japanese invaders would not seem consistent with the de-Sinofication process.